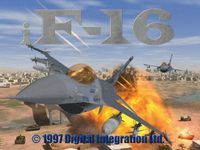 F-16 Fighting Falcon, or "iF-16: The Definitive Simulation of the F-16 Fighting Falcon" as the US release's full name is, is yet another simulation from Digital Integration, after their releases of Apache Longbow and Hind. This one is, obviously, about the F-16. This game, also, offers a quick-start, single mission or campaign mode. The campaign take place over Israel, Cyprus and Korea. It line with the previous games (Apache and Hind) this game too focuses more on the feel and action of flying an aircraft, than on simulating all the details, making it a highly playable game. Digital Integration claimed to have tried to implement this game in their 'Virtual Battlefield' (the Apache and Hind games can link up and fight over a battlefield, making it one of the first multi-simulation, multi-player games) but failed to do so in an adequate way, so eventually skipped on that.